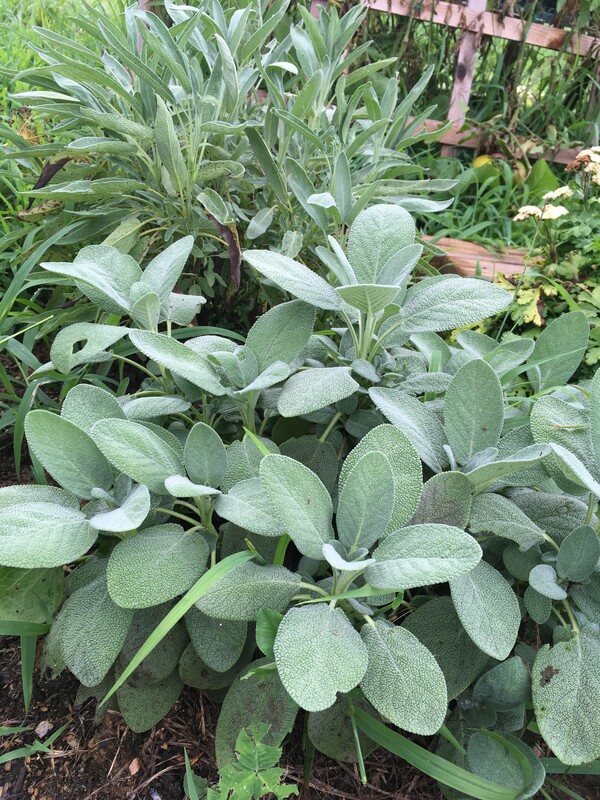 Sage is a perennial plant with a woody stem. The soft, felt-like, elongated leaves grow new in the spring, but normally stay on the stem of the plant through the winter. In the winter, the leaves have a silvery color, while in the summer, they develop a strong green color. The leaves give off a strong balmy scent. In late May to early June, the sage plant develops violet blossoms along the upper part of the stem, which give off a tender and aromatic scent. The blossoms are not used medicinally, but can be used in herbal teas. There are around 1000 varieties of sage that have been identified and/or cultivated around the world. Preparation: Dried sage leaves are administered orally as either a tea or as a tincture. For animals, an infusion is prepared from the dried leaves. 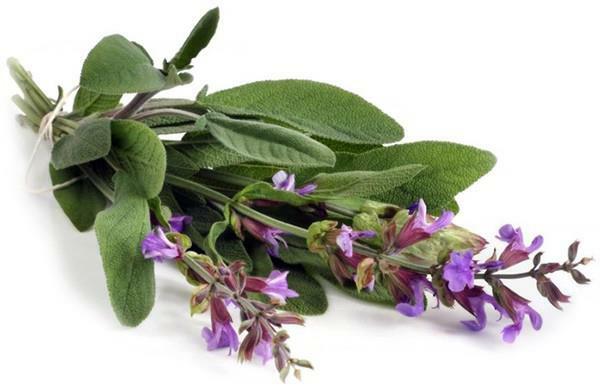 For topical applications, a sage infusion can be used as an antiseptic mouthwash and sage tincture can be used topically as an acne treatment, for example. Discussion: For my project, I decided to use sage, because it has such a rich history in medicinal herbalism. Additionally, as I learned of its antiseptic properties and uses as an acne treatment, I decided that a sage tincture might be able to help my teenage son in his struggles with acne. For my menstruum, I used 80-proof vodka. For my home use purposes, I felt that the folk method was adequate. To begin, I collected as much sage as I felt the sage plants in my garden (which I planted in May) could handle. (See picture.) I took the best leaves I could find and then brought them to my kitchen, where I chopped the fresh sage leaves as finely as I could using my kitchen knives. I thought I had more sage than I could possibly need to fill a jar… until it was all chopped up. In the end, I was able to fill an 8-ounce jar to about half-full and then I filled the jar with the vodka to where it covered the chopped sage. 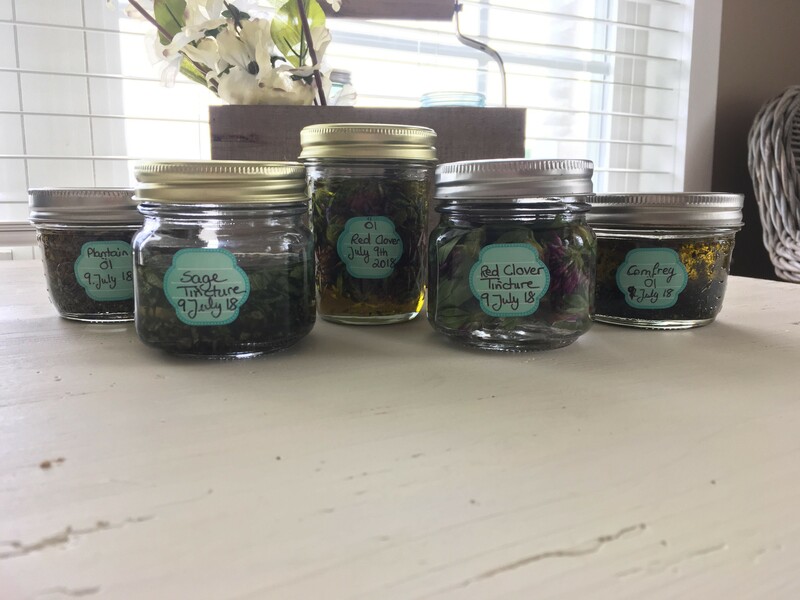 You can see it here with other tinctures and oil infusions I started on the same day: Since I was using alcohol, filling the jar to the brim to avoid air contamination was not a must. I then labeled the jar with the date I started the tincture instead of the completion date, since I work better knowing when a preparation was started and, therefore, knowing how many days it has macerated. I placed the jar in a dark cabinet and tried to faithfully remember to shake it every day. In Germany, I was taught that tinctures had to sit at least four weeks. So, my tincture sat four weeks. After one month, I let the tincture “rest” for one day and brought it back to the kitchen to be strained. In the past, I used a stainless steel superfine bouillon strainer, which is how I learned to strain and press herbs in Germany. It has always done a great job. However, it would take me days of cleaning and re-cleaning the strainer to get all the herb particles out of it. I decided to try a new technique this time, with a wider mesh “normal” kitchen strainer lined with a coffee filter. I was truly amazed with the effectiveness of this technique. It took a couple minutes for the tincture to filter through and then all I had to do was pull out the coffee filter with the remaining saturated herb material in it, squeeze the filter to express the remaining liquid, and then dispose of the waste… all with a clean strainer! I then used a funnel to fill two ounce brown glass dropper bottles with the tincture. My final product was two of these bottles full of wonderfully aromatic sage tincture. Conclusion: One of the surprises of this project was learning how much volume sage leaves lose once chopped. Despite this unexpected development, it did not prevent me from making a great tincture. The only shortcoming is the shortness of supply I created. Next year, I should have mature sage plants and I should not run into this problem again. 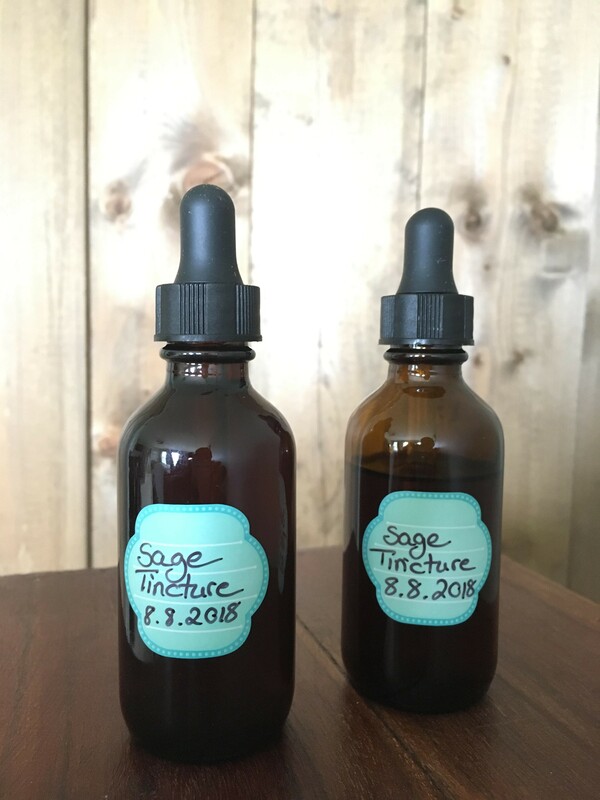 I can’t wait to see how effective this sage tincture is in helping my son tackle his next acne outbreak!